This might be one solution you could consider!!! (20, in fact, counting the covers). This shows the back cover. 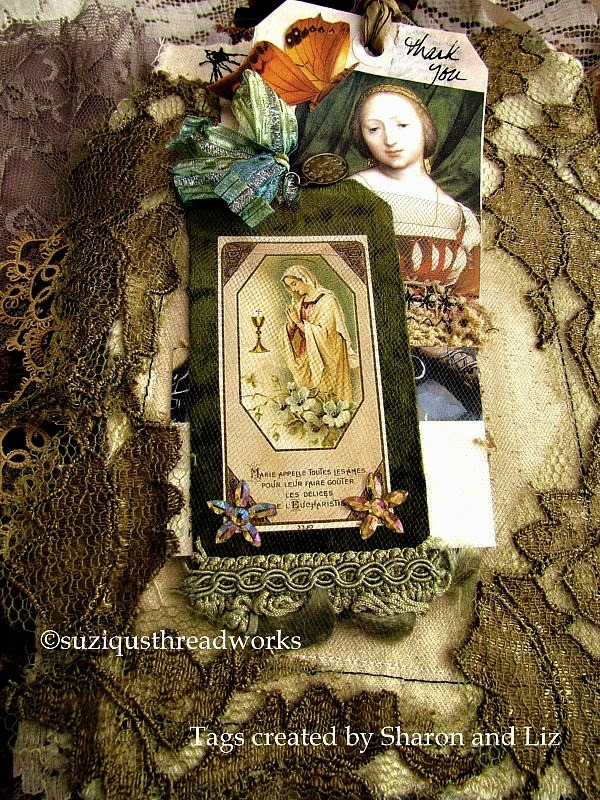 The collages and tags came as either swaps or gifts! 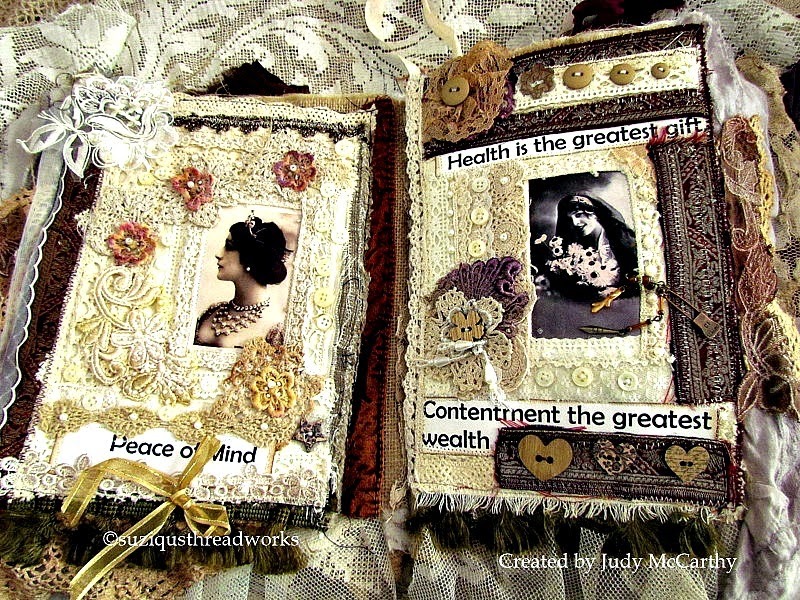 The next two came from Judy (Judith Ann's Blog). but I chose to add them here in my Friendship Book. The collage on the left with illuminated letter "S"
was also a member of the same group. with this pocket created by yours truly! with pocket by me on LHS! these dear friends and the artistry they represent. 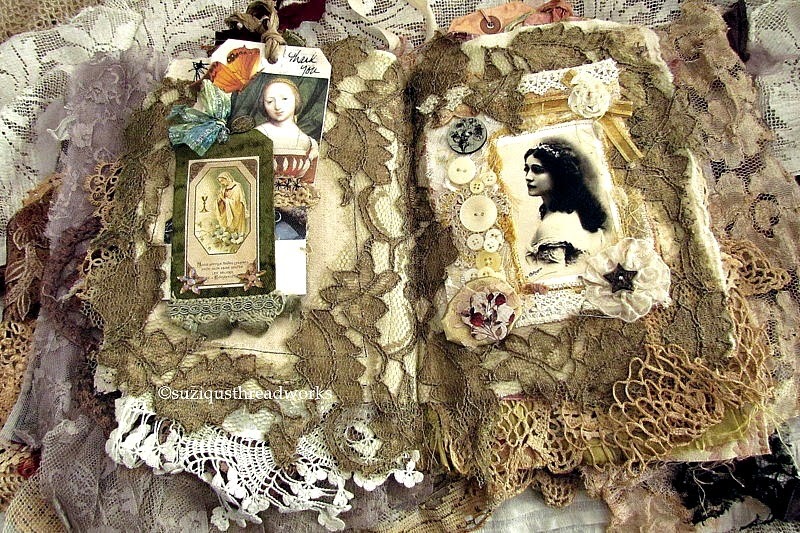 place - in a lace book of memories. talent and creativity of some of my blogging friends.! Let me know if you have created something similar!!! acknowledge that in part by this post today. 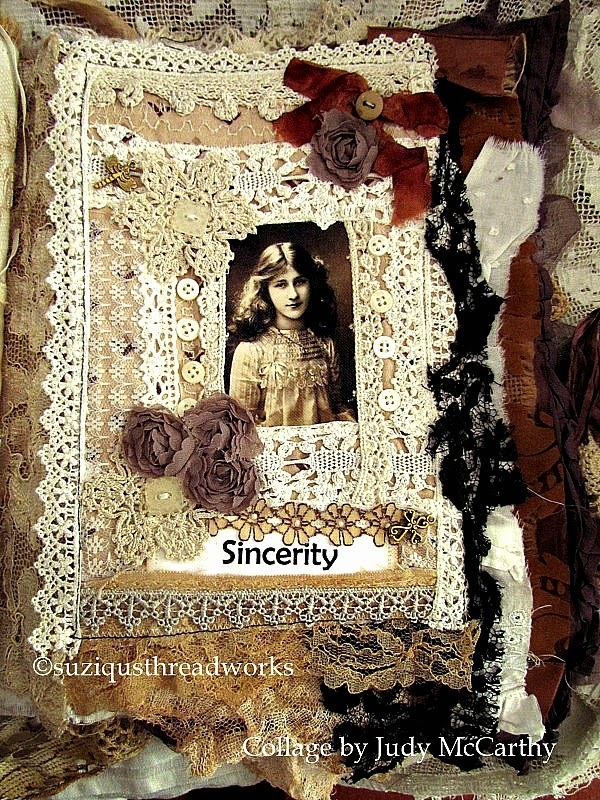 Oh Suzy I am in complete awe of this amazing friendship book! Not only are the creations contained in it so very, very beautiful, but I love the thought behind it too. 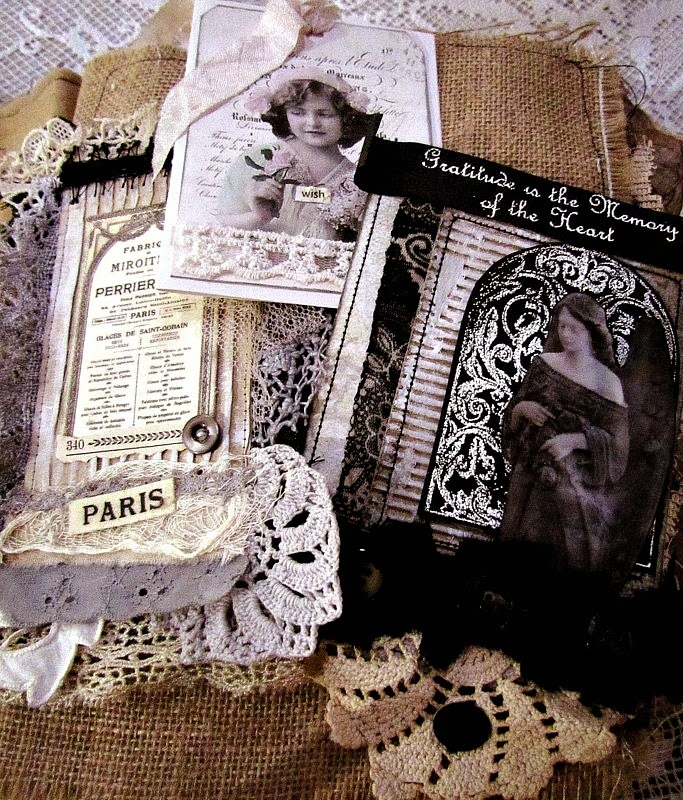 This is such an amazing keepsake full of incredible treasures, just wonderful!!! Amazing! It is so stunning online I can't imagine seeing it in person! Oh my! When I see what you've created, it makes my heart go pitty pat! 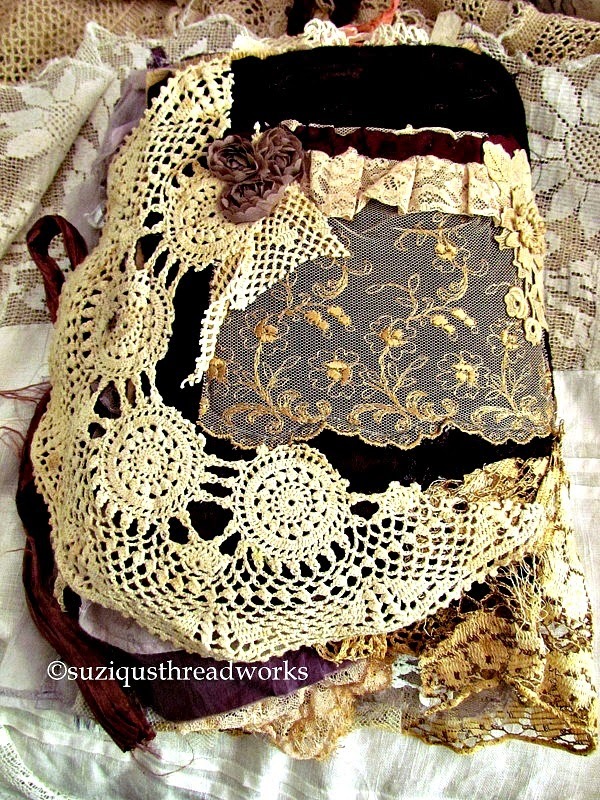 I would so love to make something like this with some of my treasures and vintage lace I've collected. 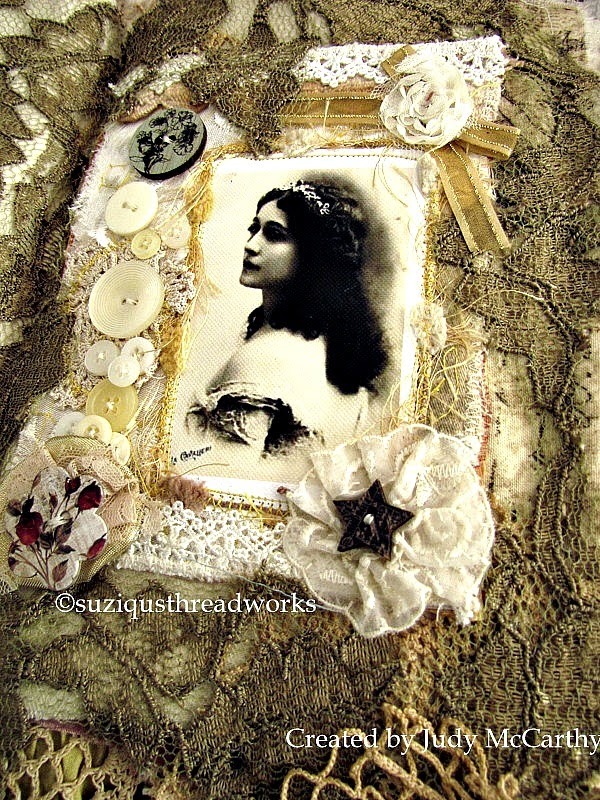 I've done something with some of my mementos but I'll send you the link in an email if you want to see. Enjoy your day! Sweet hugs! Breathtaking Suzy!!! 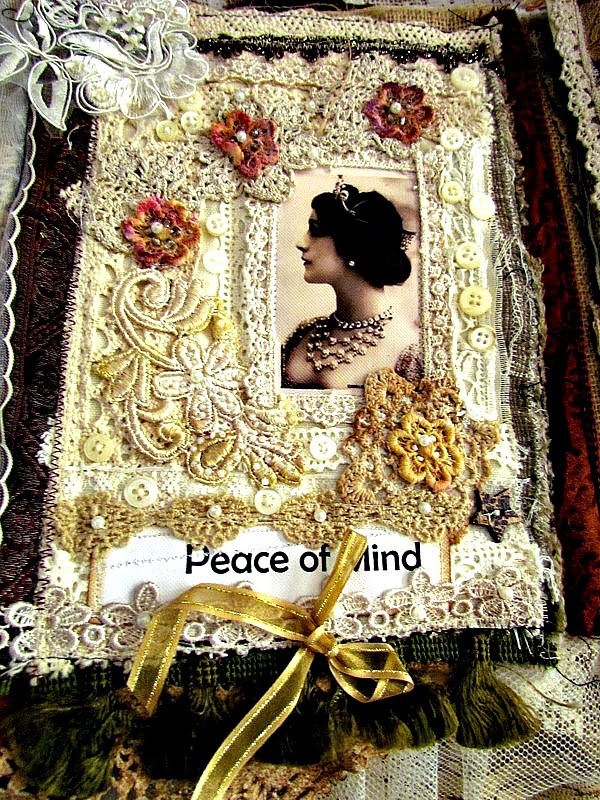 What a truly stunning treasure of a book with all the equally stunning tags and pages. 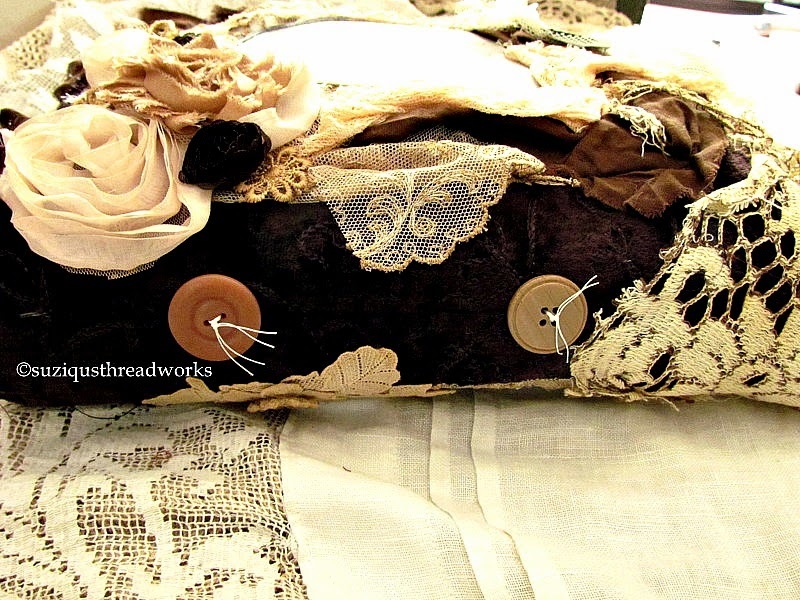 I feel like I could just sit with this and slowly run my fingers over every luscious fabric and fiber. 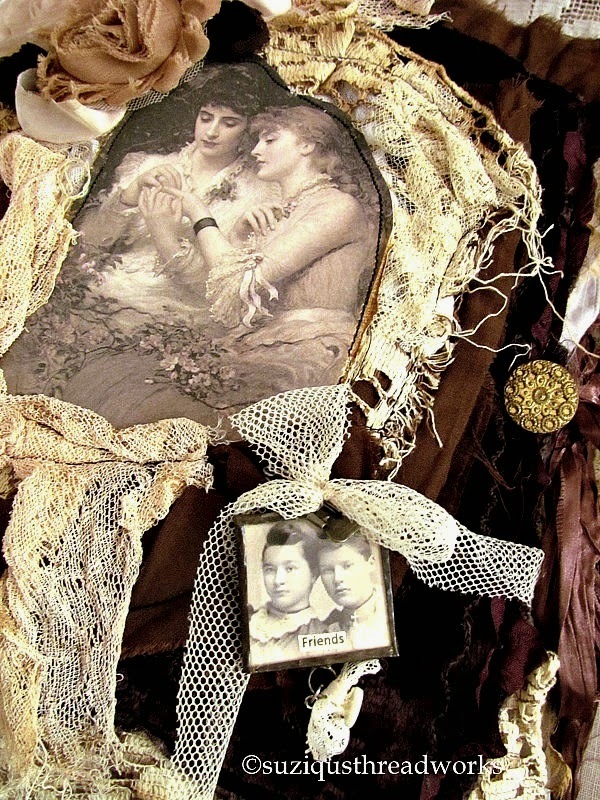 It's a perfectly lovely way to celebrate the art of friends. 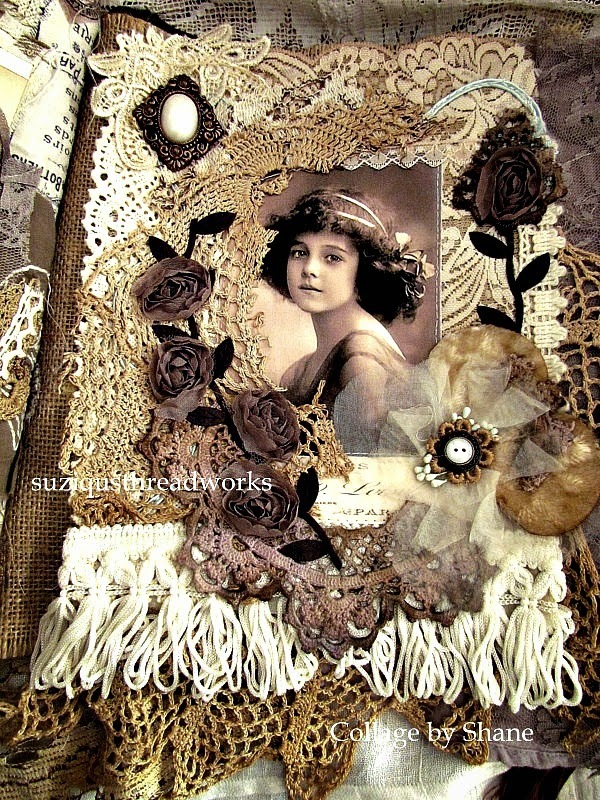 What an absolute treasure of memories you have created with this beautiful book Suzy!!! It would be hard to put into words how amazing I think this is dear, so I will just say that you are one inspiring artist and friend. And by the looks of the fatness of this book, you are gifted with so many other talented friends who love you so much. Oh my goodness, what a stunning creation. I am so honoured to be a tiny part of a book which has been created with so much love and genuine friendship. It is absolutely exquisite and so very precious. Your friendship book is the most stunning collection of beautiful artpieces from so many friends of yours.Every page showing one more fantastic and adorable piece from your own hands or from someone sending you love and friendship. Your frontcover is gorgeous dear. Like Liz, I am thankful of having a place in your precious book and in your heart. 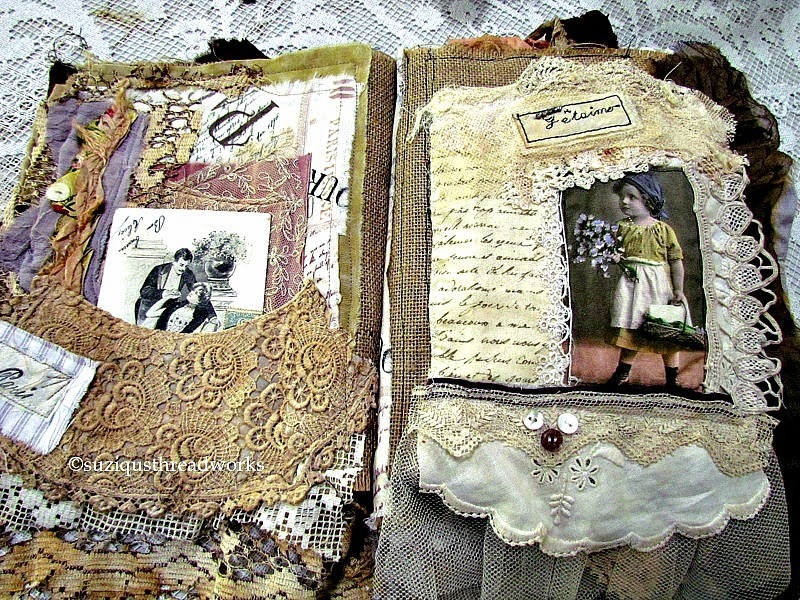 You certainly have created a very beautiful and precious memory book. 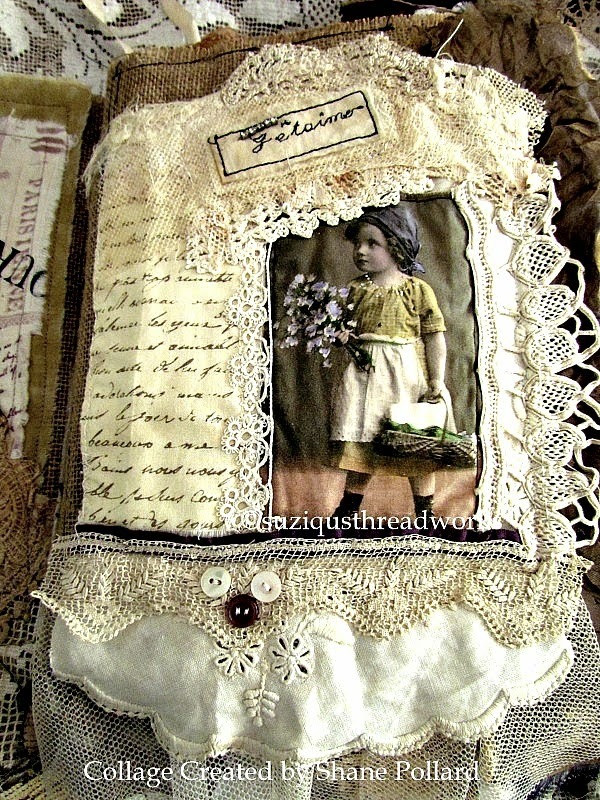 Such a nice keepsake you have created. I can imagine you looking back through this book in the years to come, remembering your friendships with a smile on your face. All those gorgeous tags, each special and beautiful. Goodness dear Suzy!! 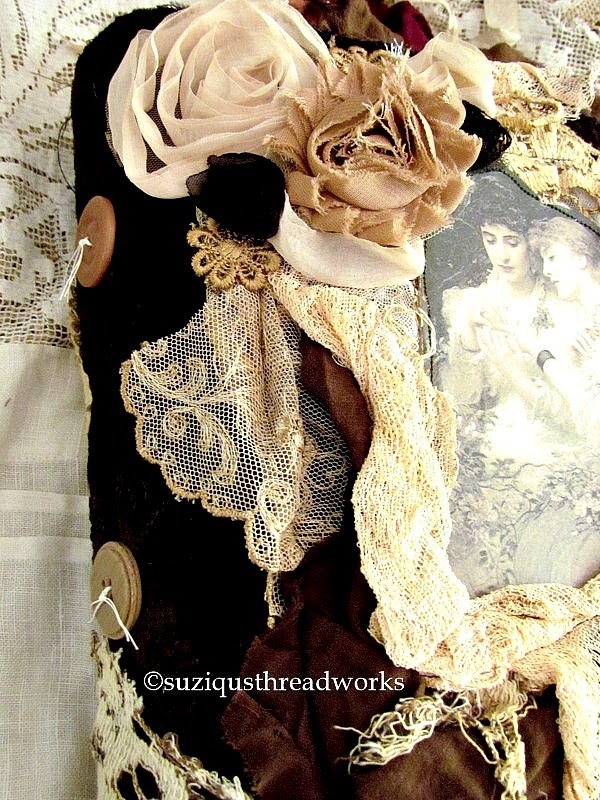 What a beautiful way to display your collection of tags and such-- the laces and embellishments are stunning-- I'm just always amazed at what you bring to life with your lovely vintage laces and such. You make us all gasp with delight! Oh Suzy! That is just an incredible creation! How lovely to keep those tags from dear bloggy friends in such a fine book! Every bit of it is stunning! 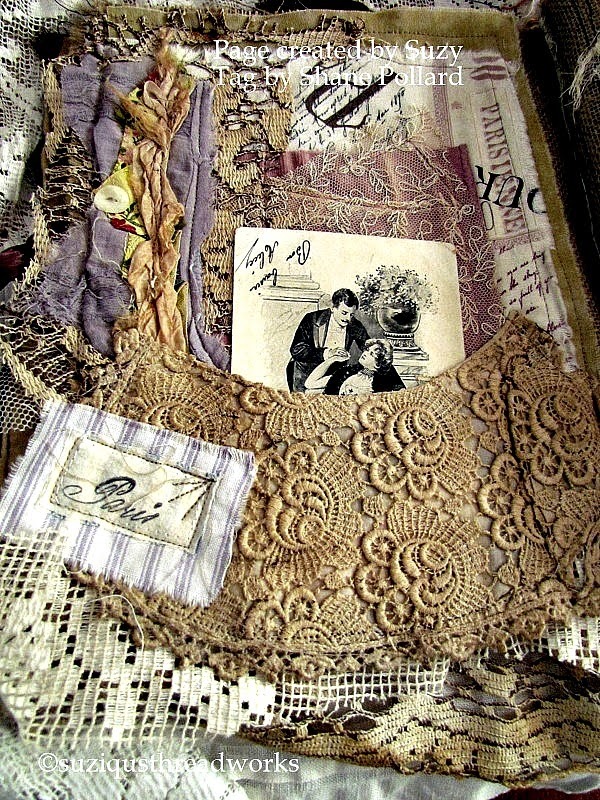 I love all your layers and layers of lace and fabric! I'm always happy to see a post from you come into my feeder because I know I am going to be treated to some pretty exquisite eye candy. This one was no exception! 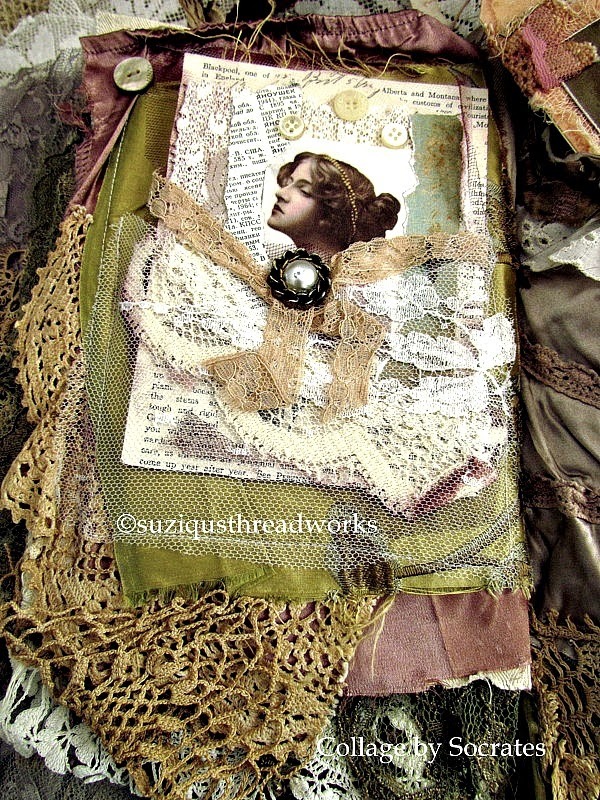 What a fabulous brilliant creation Suzy! every detail is stunning! 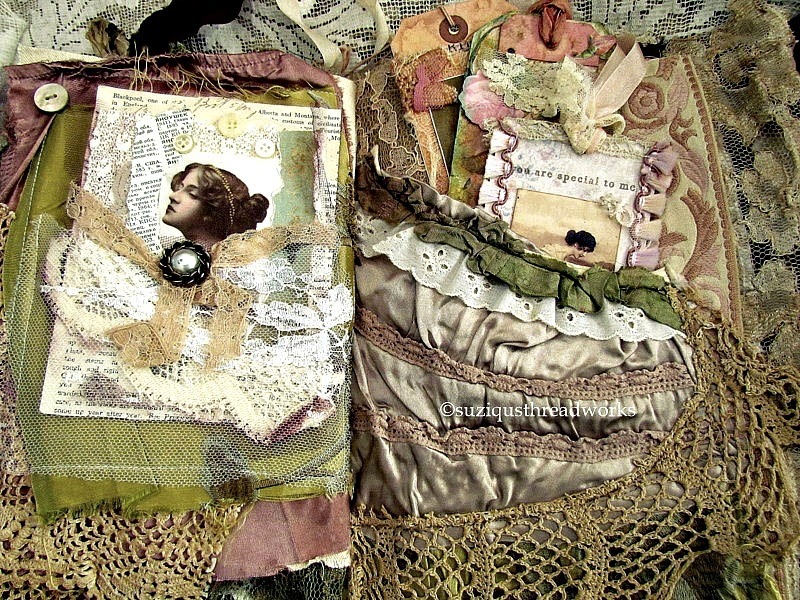 I always love visiting your blog and your work never ceases to be amazing! What a beautiful way to store all the wonderful gifts from friends you have received. It is certainly a gorgeous work of art in and of itself. Have a great weekend. These are all incredibly beautiful. Thank you so much for sharing. Your Friendship Book is a true inspiration. I love the tags especially. I just might need to create some tags to enjoy. The are elegant and wonderful. Every page is magnificent. So much detail. What a wonderful idea. Each tag made so detailed for you, and each page made so intricately to store the memorable gifts in. Such an amazing art book you have created. Just awesome to look at! Thank you so much for sharing this with us! Your Friendship Book is a fabulous idea! How beautiful! 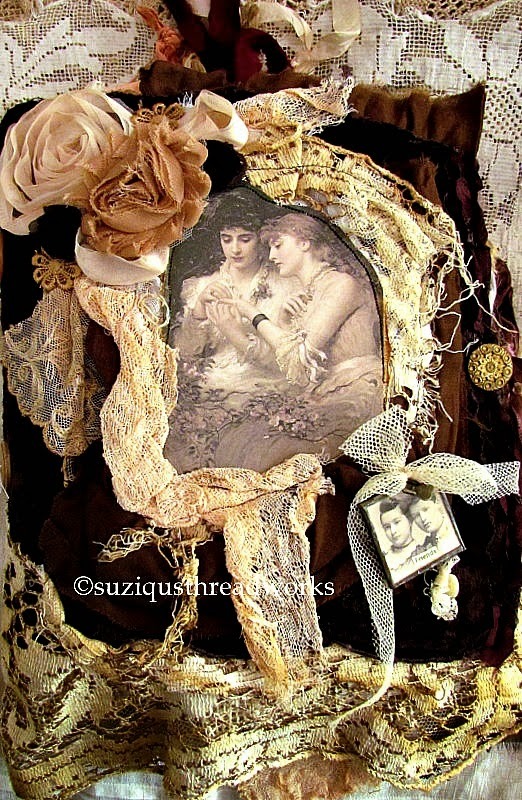 What a Gorgeous Suzy book and such a wonderful way to keep all those cherished gifts. Its Breathtaking!!! I have an entire drawer full. I just may have to borrow your idea. I hate that they are tucked away. Just not enough room to display them all. I feel very honoured to be part of your beautiful friendship book! The front cover is exquisite, a gorgeous image of two friends echoed in Marie's soldered image - a perfect start to what lies within. 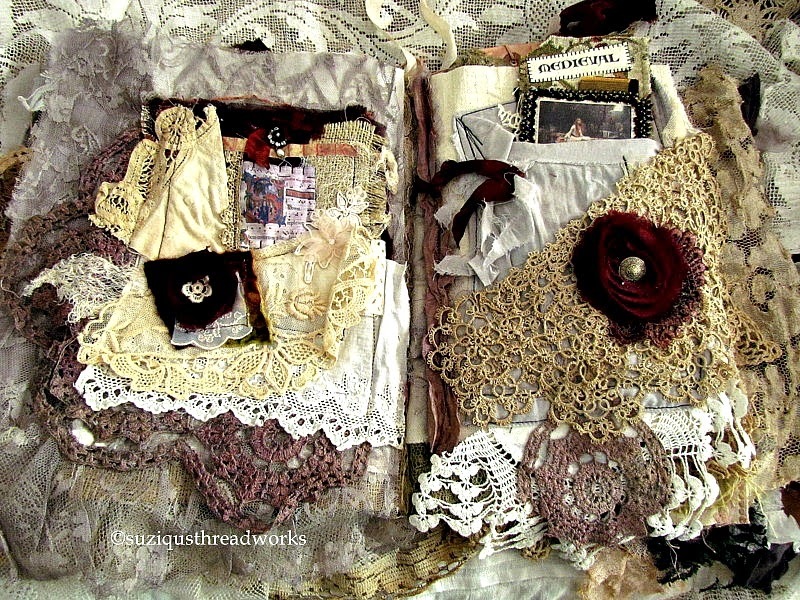 The pages you have made with the pockets are stunning, you have managed to compliment each of the other pages of our work with your amazing collection, of lace, satin and lovely embellishments. 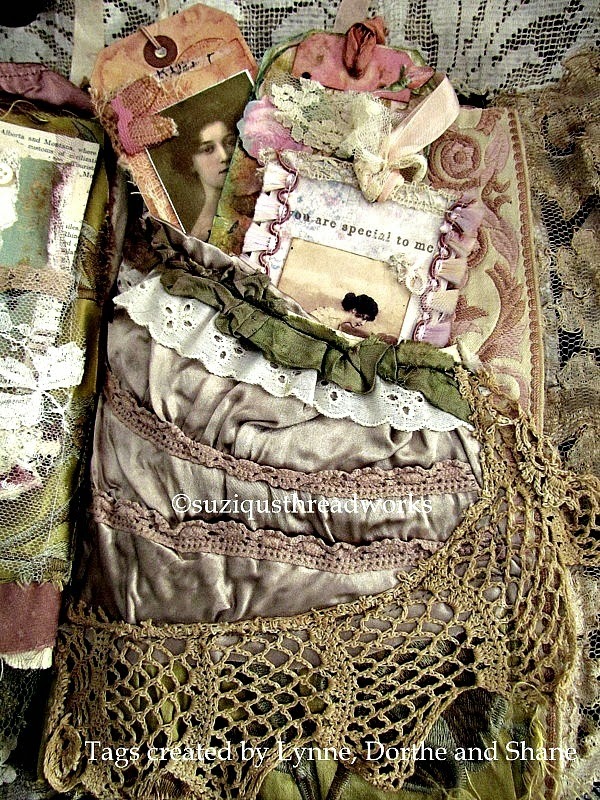 I particularly love your up-cycled satin lingerie pocket containing those lovely tags - it's so feminine and oozes that special thing I call "Suzyness" - our Queen of Collage!! 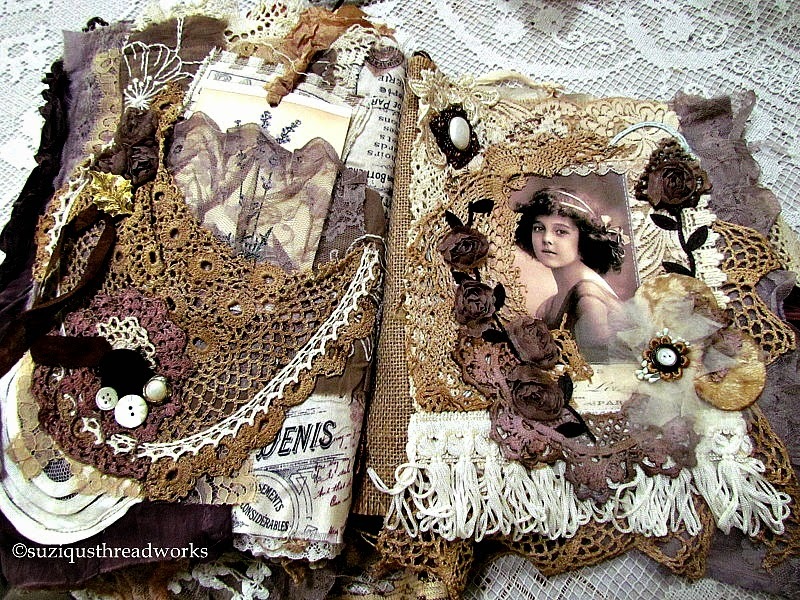 This idea of a book to hold gifted pieces has been bubbling in the back of my mind for a long time! 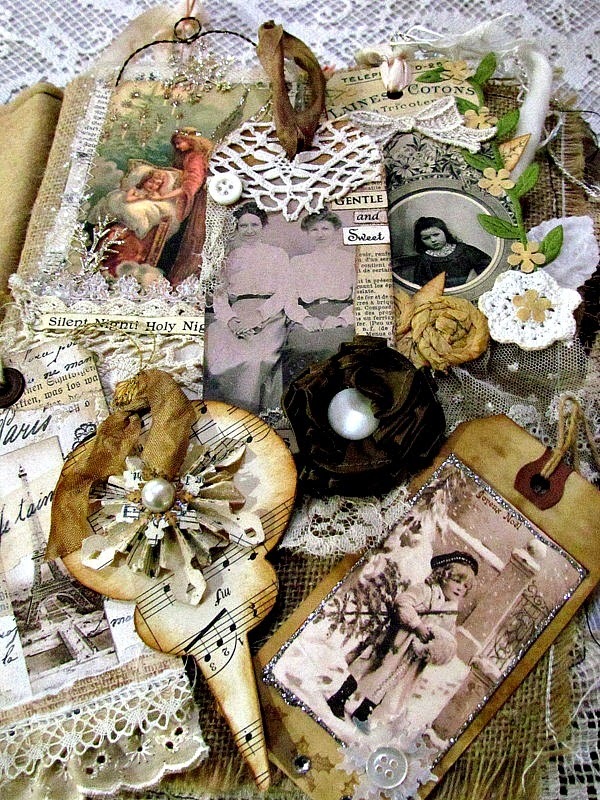 Thank you dear friend for including my collages and tags. 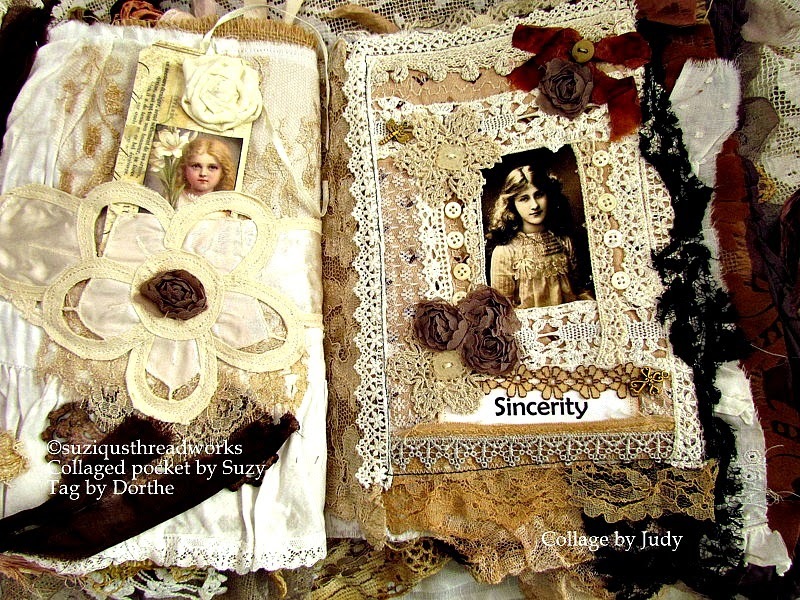 I am totally impressed by your beautiful friendship book, dear Suzy! You and all your friends are really great artists. Just a poem ! I`m excited. Stunning! 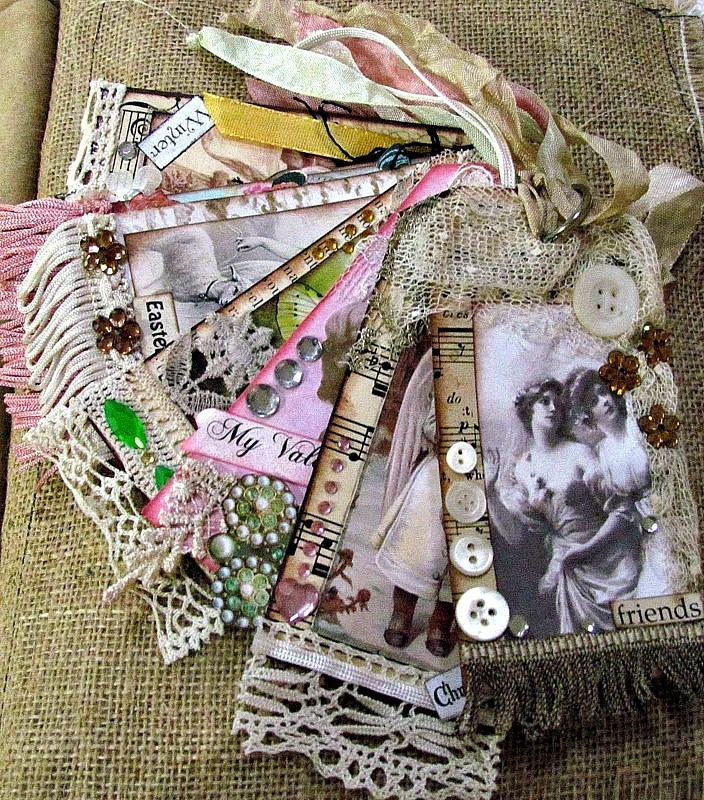 What a beautiful way to gather your friends treasures in one gorgeous book. A true keepsake. And with all the different styles of all the artists you still manage to make a whole of it. This is the most glorious and splendid Friendship Book I have ever seen! What a wonderful place to cherish all of the friends who have given you gifts or from swaps. A rare treasure indeed! 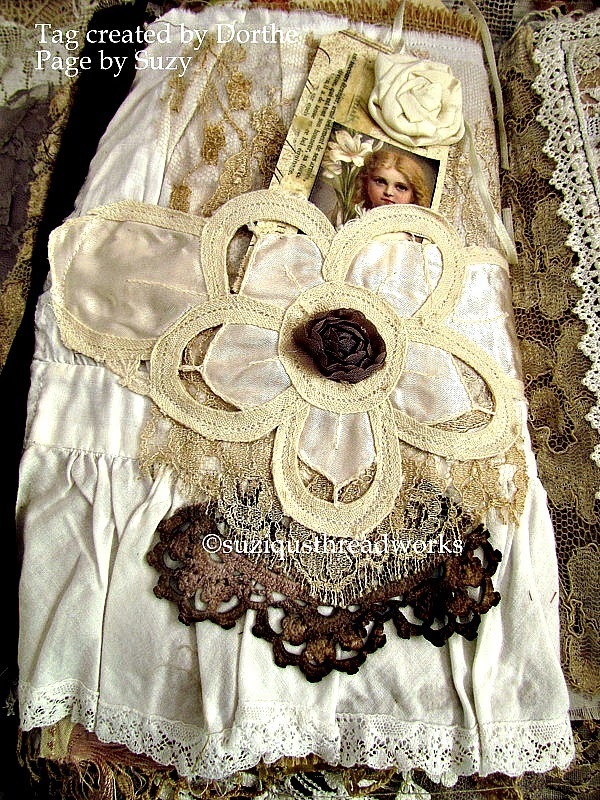 Thank you for sharing this masterpiece of vintage laces and embellishments. What a wonderful Book of Friendship you made. It is truly a work of ART !!! I love it so much. You brought all the gifts together in one stunning Treasure. Think I will be back for many times to study it over and over again :) !!! 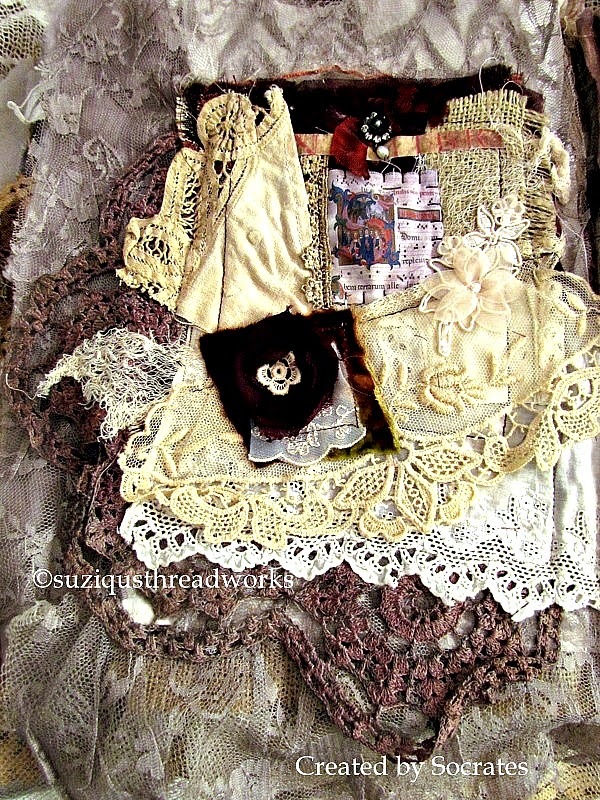 Suzy, I also want to thank you so much for your sweet comments on my blog. You've a wonderful collection. All tags are marvellous!!! your gorgeous Friendship book just takes my breath away. What a treasure and I'm thrilled the soldered charm is a little piece of it. Have a wonderful day. What a beautiful book. It shows the love you have for this wonderful creations by your friends and you. 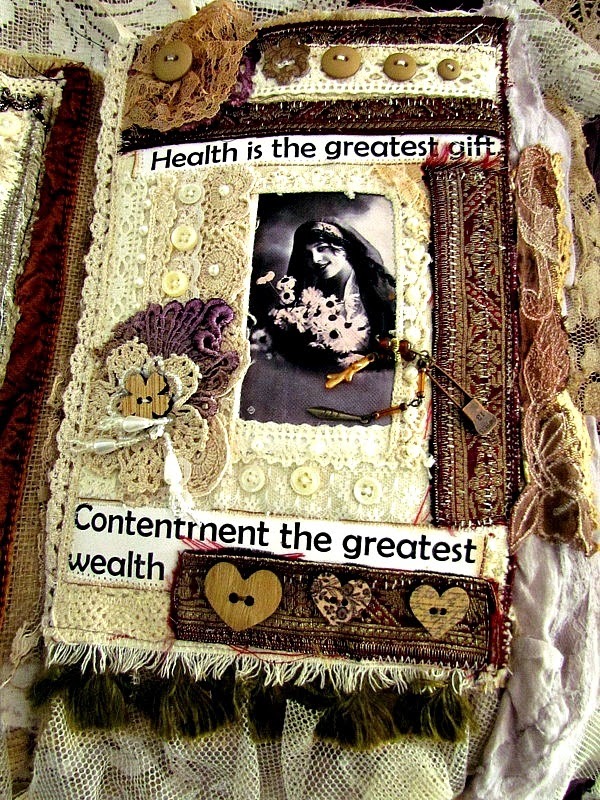 Your friendship book is a treasure with all these wonderful pages from your friends, they are all so inspiring to look at, I'm sorry that I haven't been around your blog for some time, I had a fall that gave me a concussion seven weeks ago and this has taken much of my energy, wish you a lovely new week. I just can't get enough of this book. I have saved this post on my reader so I can go back and look at your pictures over and over. It is such a beautiful expression of your lovely work as well as that of your friends. What a wonderful keepsake!